How did you become interested in the medical field? I have been interested in the medical field for as long as I can remember. I took an allied health course in high school and that peaked my curiosity even more. I got to shadow nurses and get a small taste for what their job entailed. God also put the desire in my heart, I truly believe that. What led you to start your career as a CNA? My boyfriend was a CNA back in 1995 and he encouraged me to take the CNA course and become certified. He stated that it was a good job with pretty good pay. I listened to him and enrolled in a CNA course in Hartford, CT.
Can you tell us about the process you went through to become a CNA? In order to become a CNA I took a 2 month training course at Collin Bennet Real Estate in Hartford. I was required to perform a certain number of hours of clinical training at Seabury Retirement Community in Bloomfield, CT. Once I completed the course, I was required to pass a state certification test in order to obtain my CNA license. 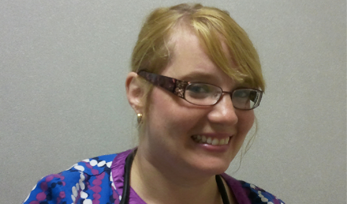 Sara O. has been a registered Certified Nursing Assistant (CNA) since 1995. After working for 13 years as a CNA, Sara is now a Registered Nurse. Where did you work as a CNA? What were some of the major responsibilities you had on a daily basis? I got a job as a full time day shift CNA at Seabury where I had completed my clinical rotation. My responsibilities entailed mostly carrying out tasks. These included bathing, ambulating, feeding, acquiring vital signs, transferring patients to and from bed, light cleaning, hygiene, and skin care. Did you enjoy being a CNA? What was most rewarding about your career? For the most part, I loved being a CNA! I loved caring for elderly who were lonely and in need. I became very attached to the residents. I am a caregiver in nature so the position and I fit very well together. My love of people made my job worthwhile every day. I think if I didn’t care about others, I would’ve been miserable. What is your most memorable experience as a CNA? My most memorable part of being a CNA was the attachment I had to a few of my residents. We became very close and they loved me. It gave me much joy to have such a close relationship with the elderly. If someone wants to become a CNA, what skills are most important to be successful? The skills that would construct a successful CNA would be hard work, dedication, compassion, assessment skills, and common sense. Being a CNA can be challenging and it can also be physically and mentally draining. CNAs must be strong in both areas. We continually hear that CNAs and Nurses are in high demand. How did you find the right job fit for you? I located an ad in the paper for a CNA/Unit secretary at a hospital in CT. I was looking to advance my career and go back to school so I jumped at the chance to work for a hospital. I worked as a CNA for 8 years, did go back to school simultaneously, and became an RN after 13 years of being a CNA. What drove you to become an RN? I would say first and foremost the desire in my heart drove be to become an RN. I also studied and looked up to the RNs at the hospital for many years. I idolized the RNs. I wanted to become one so badly I could taste it! I desired to be like they were and do everything they did. What educational path did you take to become an RN? I pursued my education and Capital Community College. I began by taking part time prerequisites in 2005. I also worked full time and had a 10 year old son! While going to school I became a single mother and had to work full time all the way through. I finally graduated in 2010 from Capital Community College as an RN with an associate degree in science. Can you tell us about some of the difference in responsibilities between a CNA and an RN? You have much more responsibility as an RN than as a CNA. RNs are ultimately responsible for everything that transpires with the patient and the CNA is not. A CNA has a certificate, whereas an RN has a license. RNs assess, CNAs do not. RNs have much more documenting to be done than a CNA. RNs have less physical labor and do get paid much better than CNAs. What would you share with a CNA who wants to become an RN? I would share with a CNA that it is well worth it to go to school and become an RN. The job is very rewarding. When I went from a CNA to an RN, I remember gaining so much respect from my colleges and people who knew me. It felt amazing to be praised as much as I was. I loved it! Would you change anything about your current profession or your industry? I would not change a thing about my profession. The nursing industry could use some changes. I would say that medical care should always be more patient oriented, there should be a smaller case load for each RN for better care to the patients. Sometimes the work load for one nurse in a hospital can be overwhelming. Any last piece of advice you would share for others who want to follow in your career footsteps? My last piece of advice would be to follow your dreams and go for it! This country has so many opportunities for advancing education. I had full financial aide all the way through school through the federal government. Pick the best, most affordable school, get lots of support, and just do it! You can do it! I’m living proof and it was worth it all and I would do it again in a heartbeat!